First, let’s head to the most important question and define what actually a rain gauge is. The rain gauge is a meteorological instrument for measuring the amount of precipitation (especially rainfall amounts) fallen during a given time interval at a certain location. In short – the rain gauge are used to measure rainfall. 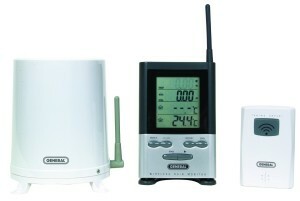 It is commonly used in personal or automatic weather stations. There are different types gauges, some use direct measurement technique or others are completely automatic. You probably wonder what type of measurement units are used, and the answer is – usually inches (millimeters) or liters per square meter. The interior of the rain gauge funnel has special coating to reduce the wetting of the surface. The cone of the funnel should be deep enough, which allows the water to flow without any risk of splash. Mesh filter are used to prevent debris like leaves of bird droppings from clogging the gauge. Place the rain collecting device at a sufficient height (usually 3 feet from the ground), and at a distance of several feet from other objects ensures that there will be no water rebound from floor or objects around. To answer this question we must first define different types of rain gauges. The rain gauges were originally manual, that is to say, a meteorological technician had to come and regularly check the rainfall amounts and empty the unit – a tedious job especially with high amounts of rain. With technological advancement in the early twenty-first century, the gauges were equipped with sensors that enable electronic collection of data to be continuous and form a distance. However, manual rain gauges are reliable and accurate and are still used by amateurs or networks of volunteer observers. 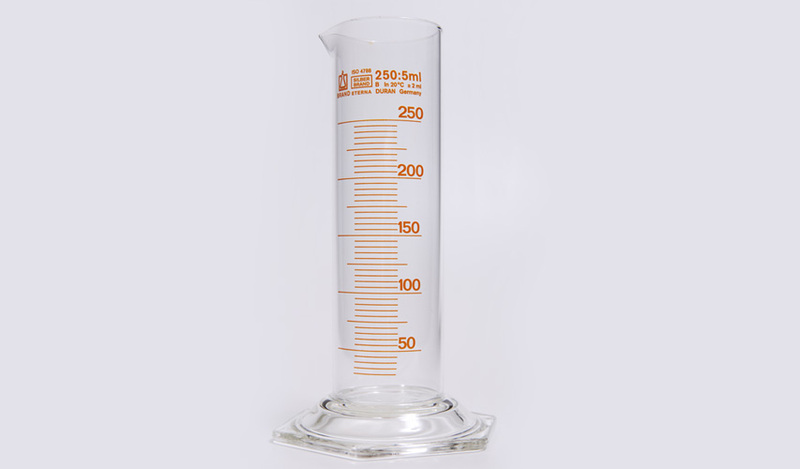 The standard rain gauge was developed at the beginning of the twentieth century and consists of a graduated cylinder (2 cm diameter) in which the collection funnel drains. Most of these gauges use scale from 0.2 mm to 25 mm. If the main unit accumulates too much water, the surplus is directed to a bigger container with diameter around 20 cm. You record the total rainfall by measuring the total height reached on the cylinder. This is a straight forward device and quite easy to use. The tipping bucket gauge is made of collector funnel that directs the rain towards a two small containers, positioned on either side of a horizontal axis. The water collects inside one of the buckets that flip horizontally when it reaches the required weight, and discharges trough the force of gravity. The amount of precipitation is measured by the number of switchovers carried by the buckets, detected by a mechanical or optical system. The advantage of this type of gauge is that it measures the rate of precipitation in addition to the total rainfall. However, when the precipitation rate is too high it may jam and report inaccurate rainfall data. Tipping bucket rain gauge is not as precise as direct measurement, because if the rain ends before one of the buckets is full, the water inside will not be counted. Later a gust of wind can tip it and give a false accumulation when there is no rain. The tipping bucket is the most commonly used type of rain gauge in home weather stations. Often times they use remote wireless communication to send their data. This type of rain uses the mass of accumulated water inside the collection container to calculate precipitation amount. Earlier models were recording the data by moving the tip of a stylus on to a graphic paper specially calibrated for this purpose. With the advance of technology the data is collected by a sensor and converted into numerical values directly into a logger. This type of rain gauge measures all the rainfall and can measure solid precipitation, such as snow and hail. 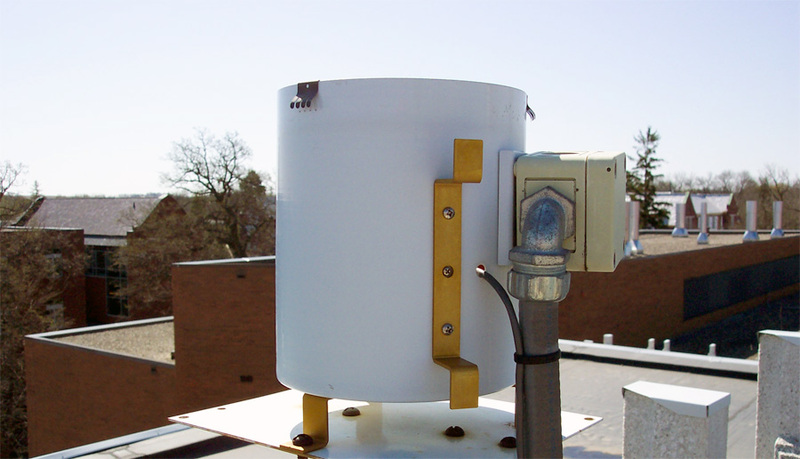 However, it is more expensive than direct-reading rain gauge and requires more maintenance than the tipping buckets. The optical gauge is has a funnel on top of a photodiode or a laser diode. Rainfall is measured by detecting optical irregularities. The funnel directs the drops at the light beam, then by measuring the intensity of scintillation it can electronically determine the rate of precipitation. What are you going to buy in terms of manufacturer and the model is all dependent on you budget and use case. 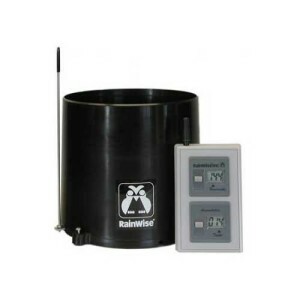 If you are looking for professional grade – electronic rain gauges- you have to lock at companies like Young with their models 52202 / 50202 and HOBO with their Rain Gauge Data Logger. But for weather enthusiast and volunteer observers the choices are more and less expensive. I am going to list a couple of models for you to have general idea what’s on the market. This is highly reliable rain gauge, recommended by the National Weather Service, and used by CoCoRaHS enthusiast around US. It can measure up to 11 inches of precipitation with 1 inch inner and 13 inch outer tube. The inner scale is easy to read and can measure 1/100ths of an inch of rain which that gives good accuracy. The installation is easy; just make sure it’s not close to buildings or trees. If you are not looking for remote electronic device I strongly recommend this one. 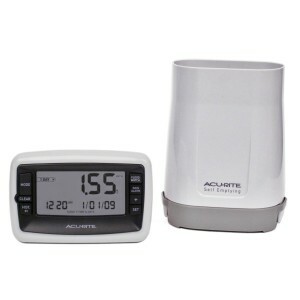 This is easy to read standard type rain gauge by AcuRite. It measures up to 6 inch of rain and the scale is on every 1/10ths of an inch. The gauge has options to be mounted on the fence or stick on the ground. It is made of hard plastic but don’t let it freeze with water inside because it may break. This model is not as good as Stratus RG202, and can’t be use for reporting precipitation with any of the networks. But if you don’t need all of this it’s reliable and easy to read device. For the wireless (remote) tipping bucket type gauges the choice spectrum is much wider. Lest see couple of options. 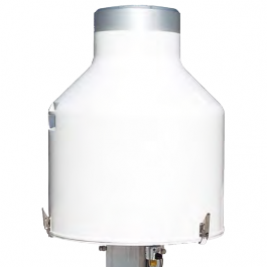 The second wireless rain gauge in our short list is Oregon Scientific RGR126N. The biggest advantage of this type of sensors is that you are skipping the hassle to go outside and check the unit, and the ability on some of the devices to log historical data. The RGR126 adopts the tipping bucket design and features two part system – outside sensor and inside display unit. This model also includes an outside thermometer for some temperature readout. The data resolution of RGR126N is .04 inches which makes it quite accurate. The indoor unit will display daily and cumulative rainfall for the past 10 days. Data can be transmitted from up to 300 feet. The only maintenance you have to do is check for clogging and change batteries every 12 months. You can use Lithium AA batteries for longer operation. The RGR126N is a pretty decent gauge with reasonable price. This is a cheap wireless rain gauge that has all the necessary parts like self emptying tipping bucket and indoor display unit. The unit has 0.01 inch precision – very good for device in this price segment. It has flood alarms and can report historical data. 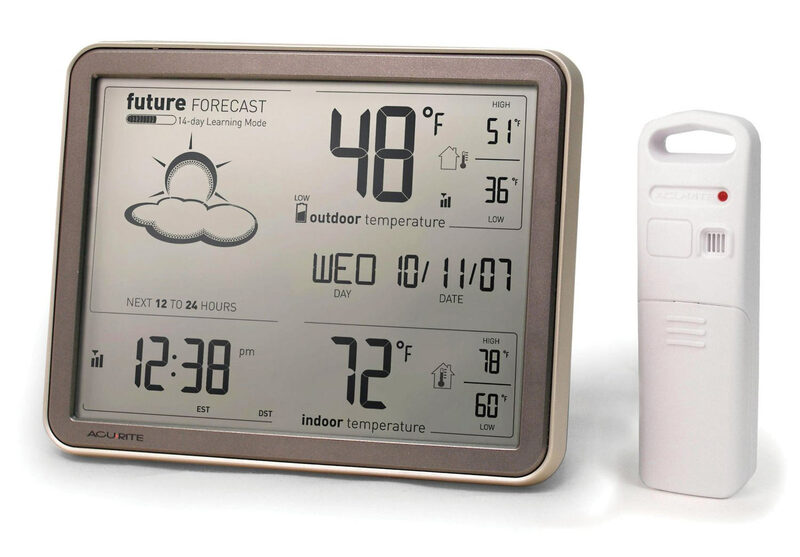 It’s a great device for birthday present or young amateur meteorologist. Be sure to check the AcuRite website on how to calibrate the device. If you are looking for professional and affordable wireless rain gauge this device may satisfy your needs. The RainWise RAINEW meets all the NWS specifications and standards for statistical accuracy. The device is calibrated and has data resolution of 100ths of an inch and can measure up to 9.99 inches of rain. It comes with their 8 inch self-emptying tipping bucket that will spare you the trips outside to empty the gauge. Just position the bucket in an open area and read the date on the indoor display. The thing I like about this model is the convenient minimalist dual display for tracking both current and cumulative (annual) precipitation amounts. No additional data and no fancy stuff. Any of the counters can be set to zero at any given time. The transmitter operates up to 300 feet away. To power the console use 3 AA batteries that will give you up to 9 months life and for the gauge use 2 AA with 12 months life span. With today’s fast and reliable digital communication I cannot point how easy is to share your data. It is an important part of being a amateur meteorologist. So please consider doing it. They are both community projects and the only thing you need is enthusiasm and some equipment (rain gauge or home weather station) to collect data. CoCoRaHS is a network originated with the Colorado Climate Center at Colorado State University in 1998 thanks in part to the Fort Collins flood a year prior. This is a community project everyone can help young old or in between. The only requirements are and enthusiasm for watching and reporting weather conditions and a desire to learn more about how weather can affect impact our lives. On CoCoRaHS site you will find lots of materials on how to mount you rain gauge, how to measure rain snow and hail. Be sure to check what type of gauge you can use because the network does not use any automatic type instruments. I think you pretty much have to use the Stratus RG202. Check the CoCoRaHs official data sheet to get an idea what reporting form looks like. Every day thousands of volunteers in the Coop program collect and submit data from their weather stations. This citizen observer effort officially began in 1890. The cooperative observer program is at the heart of climate measurement in the United States. There are over 11,000 stations across the country. The observer careful records of whether form the foundation of the climate information. Each station has precise scientific instruments to measure temperature precipitation evaporation and snow depth. If you are interested about reporting data to this program, check their website for additional info. Be advised that you may need a personal weather station to share the full spectrum of data that NWA can collect and process. The collected data is used for variety of applications, from watershed management activities to drought planning at local, county, and state levels. There is couple of sites with live precipitation data reported by amateurs with rain gauges across USA.